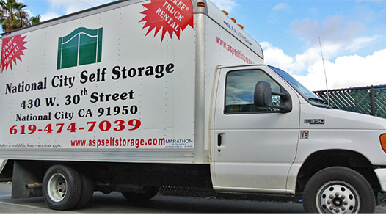 National City Self Storage - Self Storage Units | Free Move In Truck! At National City Self Storage, our mission is to provide customers with the experience of superior customer service, secure in the knowledge that our facility is well-maintained and enhanced by friendly, qualified, professional staff. We offer storage, service, and solutions sure to exceed your expectations. Our managers and clerks are hands-on, friendly and generally know our tenants on a first-name basis. We put customer service first. Our main objective is to surpass our customers&#039; expectations with outstanding service, convenience and top-notch security. National City Self Storage is one of 30 family-owned and operated storage facilities in the Southwestern U.S. Our parent company - A Storage Place - has been in business for over 35 years. Great customer service, clean, easy location, overall great !!! Perfect storage place, easy to reach. Parking can be a bit difficult. The price of monthly rentals are WAY too high ! there is no reason for a 10'x10' unit to cost nearly $200 per month. Haven't had issues and I'm satisfied with my storage facility. Ladies in the office are so friendly and always smile every time I come in .... Plus I feel like I got a good deal with National City Storage And its stress free. I have been with National City Self-Storage for some time now. I wouldn't want to be anywhere else. Its a great place to stow belongings. You have a sense of security which is very important to me. Business is handled very professionally. Staff is very nice and helpful. Thank you for making your customers your priority. National City Storage is a "FIVE STAR" facility for numerous reasons---included are personal, polite, and helpful staff, easy access to storage units, and the cleanliness of grounds and building.